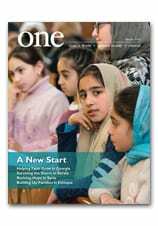 Cory Eldridge wrote about the plight of Iraqi refugees in Jordan for the Spring 2013 issue of ONE. One of the people he met was a very busy Syriac Catholic priest. After Father Mansour Mattosha spent a day driving around Amman visiting parish families, a Jesuit school and then finally his small Syriac Catholic church, I was worried about him. The priest has been in Amman for three and a half years, which makes him the longest-serving priest in the parish’s 64 years. The majority of his parishioners are Iraqi Christians, refugees who have fled horrific violence, destroyed neighborhoods and broken communities. Most of them arrive with just a few thousand dollars, usually made from selling a home and all the non-transportable valuables they own. They arrive in Amman separated from their families, friends and a land their ancestors have called home for thousands of years. After going around town, we finished our day in the dining room of his exceedingly tidy apartment, just a door or two away from the chapel. The parish cannot afford a caretaker for the church. He served me tea while he drank hot water to stave off the cold, saying he cannot drink more than a sip of tea without becoming wired. Then he told me about his cousin who had been kidnapped. Like most of his congregation, Father Mattosha comes from a small city called Qaraqosh, just outside Mosul in northern Iraq. His cousin, a chicken farmer named Ghassan, was abducted. The criminals, as Father Mattosha calls them, demanded $30,000. He chipped in money, along with his brothers, to ransom Ghassan. Luckily, the kidnappers kept their word and released Ghassan. That was when I became concerned for Father Mattosha. He has suffered many of the same losses as his parishioners and then in the course of his ministry he suffers theirs as well. After a day of doing pastoral work, he is left to his church, his prayers, and his thoughts. I asked him who ministers to the priest. Being alone at the church, he says, helps him better understand his parishioners. It is a lonely life away from home.